One of the most embarrassing moments in my life involved a giant baked vegan lasagne and the evil oven of a Jersey Shore rental apartment. I was seventeen, living in Ocean City, New Jersey with about 5 (sometimes 10+) friends in a one-bedroom apartment a block from the beach and the boardwalk. It was the summer before my first year of college. I’d invited a girl I’d just met and was eager to impress, and I’d prepared this mega lasagna — enough to serve the roomful of people hanging out, too. As I was pulling out the oven tray to remove the finished, steaming-hot lasagna, the tray popped out of the slots, forming the perfect slope aiming my giant lasagna right at the floor. I watched in horror as it slid — in slow-motion and way too hot to grab — tumbled off the metal tray, flipped over and landed top down. On the carpet. In front of everyone. Did we eat it anyway? Heck, yeah. It was like a lasagna upside-down cake. I had to trash of the top layer, but managed to save the rest. Once I got over my initial embarrassment, we all laughed. And if my memory is correct, the lasagna was pretty tasty and we all liked it. In the nearly 20 years since then – my lasagna skills, and my oven rack handling skills have improved tremendously. But I still, to this day, never trust an oven. Each and every time I ever take a casserole, lasagna, quiche, or pie out of the oven, I never pull the tray out. I just reach in with oven mitts and hold on for dear life with both hands and take out my baked dish. This is an extremely versatile recipe for all kinds of vegan lasagna. Instead of zucchini and mushrooms you can use spinach, thinly sliced broccoli, eggplant, or go wild with asparagus or something else you fancy. 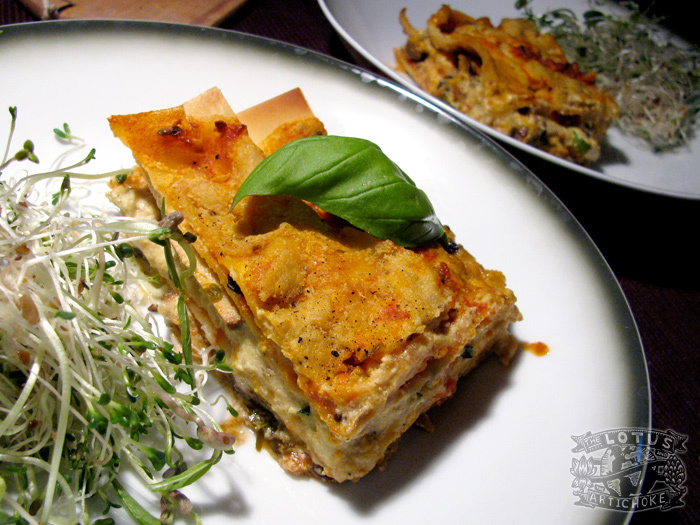 Of course, there’s also always straight-up lasagna with just crumbled tofu and “cheeze” and red sauce. Or you could marinate and fry up some tempeh crumbles, soy granulate, or store-brought ground faux-meat. Too lazy to make red sauce? Fine, go with a store sauce, but at least once you should try to make your own, starting as a minimum with tomato purée. Homemade sauces are the best! These days we can get all these fancy store-bought vegan cheese alternatives. They’re fun and delicious, too, and worth playing with. But I’m proud of my from-scratch old school recipe. It reminds me of the early years, still tastes amazing, and is more affordable and uses less packaging and glitz. After all, not everyone has a specialty organic, vegan-oriented store just around the corner. Check out this recipe, make your own excellent lasagna, and tell me how it goes! And hold on tight with your oven mitts. Purée tomatoes with 1/2 cup water. Heat olive oil in a medium saucepan on medium. Add garlic, shallots, pepper. Fry until lightly browned, about 2-3 min. Add balsamic vinegar (to deglaze), Add tomato purée, tomato paste, sugar. Bring to soft boil, stir regularly, cook 5 min. Add remaining water gradually, stir regularly, simmer on low, reduce, about 5 min. Add rosemary, thyme, oregano, sage, salt. Simmer, continue to reduce, 3-5 min. Sauce should be thinner than usual for pasta, as lasagna noodles will absorb liquid. Purée 100 g tofu with 1 cup soy milk, pour in medium pot on medium heat. Add oil / margarine, rest of soy milk, water. Bring to, maintain low boil. Add each remaining ingredient gradually while mixing well with a whisk. Whisk regularly, cook until sauce thickens, about 4-6 min. Lightly oil medium large (20 x 26 cm / 8 x 10 in) baking / casserole dish. Arrange a layer of noodles overlapping to form bottom. Use about 1/3 of red sauce and coat noodles thinly. Arrange 1/2 of zucchini slices to cover noodles. Arrange 1/2 of sliced mushrooms, 1/2 of smoked tofu strips on top of that. Sprinkle with salt, pepper, chopped parsley. Pour and spread about 1/3 of cheeze sauce over vegetables and tofu. Arrange a layer of overlapping noodles across (perpendicular) previous layer, cover with red sauce, arrange remaining zucchini, mushrooms, smoked tofu. Spring with salt, pepper, parsley. Top with cheeze sauce. Arrange last layer of noodles, top with remaining red sauce, remaining cheeze sauce. Bake for 35-45 min. Lasagna is finished when edges and top are browned, crispy, all vegetables are cooked. Remove from oven, allow to cool and solidify 10 min before cutting. Garnish with basil or parsley and serve. Vedic vegan lasagna: For red sauce replace garlic and shallots with 1/2 tspn brown mustard seeds, 1/2 tspn ground coriander, 1/2 tspn paprika, 1/4 tspn asafoetida (hing). Replace mushrooms with more zucchini or with crumbled tofu. This entry was posted in Italian and tagged cheeze, italian, lasagna, mushrooms, recipe, tofu, vegan, zucchini. Bookmark the permalink. 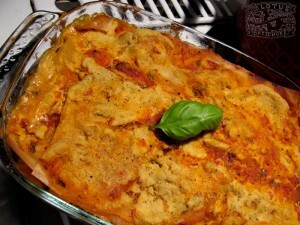 I am so going to make this beautiful & stunning looking vegan lasagna!!!! I can’t wait to try it! ;) MMMMMM! I also love smoked tofu a lot! Question regarding this recipe if I decide to make and assemble it and freeze it to cook later, how well will this recipe feeze; and how long do you think I need to cook out frozen? Stephen, I haven’t experimented with freezing before cooking, but I imagine it would work. I’d let it thaw for 30-60 min before cooking and possibly add 10-20 min to the oven time since you’ll be starting from chilly instead of warm. For better results you could try to assemble and cook it, let it cool, wrap it well, then freeze it. Then re-heat it in the oven whenever. Frozen (cooked) lasagna, I do know, lasts a long time in the freezer and usually re-heats very well. My mom taught us that! That´s the second recipe I tried from your blog and it is fantastic! We couldn´t stop eating because it was so amazing!! ssshhh we nearly managed to eat it all with two persons only – thats embarassing isn´t it? Catrin, Not need to feel embarrassed. I can eat a whole lasagna like this one in two sittings. :-) I’m happy to hear it turned out so well for you! Let me know what’s next.